Have you ever thought of a new design event marquee? Home / event marquee / Have you ever thought of a new design event marquee? Have you ever thought of a new design event marquee? 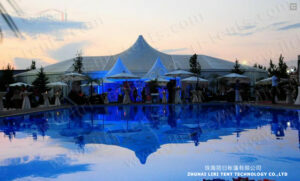 –holding wedding, party, banquet and other business events in marquees. Holding events in marquees can not only solve the problem of limited place, but also provide a special lifetime good memory in a new design event marquee. Compared with hotel ceremony, holding events in a new design event marquee are more flexible. No place and scale limited, Indoor or outdoor, 100 people or 1000 people, you can choose them by yourself. Holding events in marquees also no time limited. You can set up the new design event marquee one or days before the event, and you can control the time of the party by yourself. At the same time, the layout of the new design event marquee can be different, European style, garden wedding style or traditional Chinese style; all these styles can be showed in a event marquee. If you want to have a warm and elegant events, you can set up some roof lining decoration and lighting system in the new design event marquee. If you want to have a simple but relax event, you can set up a transparent marquee. In the evening, you and your guests can enjoy the good view of outside, such as the moon, star and beautiful fireworks. If you want to have a unique event, you can do the carve patterns design of the PVC fabric, print the pictures you like on the roof cover, so as to make the events looks more special and personal.